Update! Preview the course here and here. 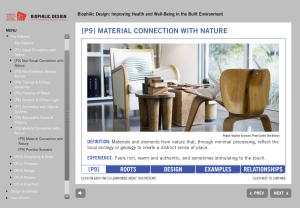 The American Society of Interior Designers (ASID) offers an online course on biophilia, “Biophilic Design: Improving Health and Well-Being in the Built Environment,” for interior design. Co-developed with Terrapin Bright Green, the course applies Terrapin’s research in the publication 14 Patterns of Biophilic Design to interior design. It reviews the science behind biophilia and discusses how interior designers can apply the 14 patterns to a wide range of projects, from residential interiors to offices to healthcare facilities. This hour-long course is available to anyone wishing to earn 0.2 IDCEC CEU credits, 2 AIA LUs, expand their skills, or understand more about this burgeoning field of green design. An introduction to biophilia and its scientific support. To take the course (available to anyone at any time), please follow this link.